SEOUL, South Korea (AP) — President Donald Trump said efforts to curb North Korea’s nuclear weapons program would be “front and center” of his two-day visit to South Korea and he projected optimism that the rising tensions could be abated peacefully. Trump repeatedly addressed interlocking issues of security and trade at the heart of his visit after arriving Tuesday, saying he would be meeting with generals about North Korea. “Ultimately it will all work out. Because it always works out. It has to work out,” he said. And later, after receiving a formal welcome from South Korean President Moon Jae-in, Trump also praised Seoul’s expansive purchases of American military equipment, which he said goes a long way to making the trade relationship between the two nations more equitable. Moon said he hoped Trump’s visit would be an opportunity to resolve “anxiety” in the region over North Korea. Trump, in his own brief remarks, said Pyongyang would be “front and center” of discussions but avoided the fiery language he has used so often against North Korea and its dictator, Kim Jong Un. Trump, during a visit to Camp Humphreys that began his visit, sat with troops for lunch in a large mess hall. Moon was also seated at the table. “Good food,” Trump told reporters as he chatted with U.S. and Korean service members. U.S. and South Korean officials have said the base visit was meant to underscore the countries’ ties and South Korea’s commitment to contributing to its own defense. Burden-sharing is a theme Trump has stressed ever since his presidential campaign. Trump is skipping the customary trip to the demilitarized zone separating north and south — a pilgrimage made by every U.S. president except one since Ronald Reagan as a demonstration of solidarity with the South. A senior administration recently dubbed the border trip as “a bit of a cliche” and several other members of the administration, including Vice President Mike Pence, have visited the DMZ this year. And the White House believes that Trump has already made his support of South Korea crystal clear. Trump and Moon agree on the need to pressure the North with sanctions and other deterrence measures. But Trump has warned of unleashing “fire and fury,” threatened to “totally destroy” the North, if necessary, and repeatedly insisted that all options are on the table. Moon, meanwhile, favors dialogue as the best strategy for defusing the nuclear tension and vehemently opposes a potential military clash that could cause enormous casualties in South Korea. On a personal level, Trump and Moon have not developed the same close rapport as Trump has with Abe or even China’s Xi Jinping. Part of Moon’s mission during the visit will likely be to strengthen his personal ties with Trump, said Michael O’Hanlon, a senior fellow in foreign policy at the Brookings Institution. Trump was spending Tuesday in meetings with Moon, hold a joint press conference and be feted at a state dinner. 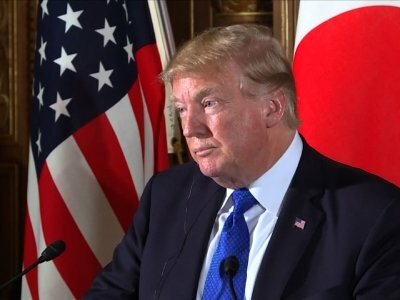 Trade also is expected to be a major topic of discussion: Trump has considered pulling out of the United States-Korea Free Trade Agreement, also known as KORUS, blaming it for the U.S.-South Korea trade deficit. Associated Press writers Ken Thomas and Catherine Lucey in Washington contributed to this report. Follow Colvin on Twitter at http://twitter.com/@colvinj and Lemire at http://twitter.com/@JonLemire.